For retail/e-commerce websites that sell physical products, one of the worst things that can happen is having your products be out of stock. Imagine that you have done a lot of marketing and campaigns to get people to come to your site, led them to the perfect product, only to find that for some people, you don’t have enough inventory to sell them what they want. Nothing is more frustrating than having customers who want to give you their money but can’t! Often times, inventory is beyond the control of merchandisers, but I have found that monitoring the occurrences of products being out of stock can be beneficial, if for no other reason than, to make sure others at your organization know about it and to apply pressure to avoid inventory shortfalls when possible. In this post, I am going to show you how to monitor instances of products being out of stock and how to quantify the potential financial impact of out of stock products. If you have SAINT Classifications that allow you to see products by category or other attributes, you could also see this Out of Stock percent by any of those attributes as well. In this case, it looks like there are several products that are frequently out of stock, but overall, the total out of stock percent is under two percent. However, these dollar amounts are a bit fake, because it is not ideal to assume a 100% product view to order conversion for these out of stock products and doing so, greatly inflates this metric. Therefore, what is more realistic is to weight this Out of Stock dollar amount by how often products are normally purchased after viewing the product page. This is still not an exact science, but it is much more realistic than assuming 100% conversion. In this report, I have added Orders and this new Weighted Out of Stock Amount calculated metric. If you look at row 4, you can see that the total Out of Stock Amount is $348, but that the Weighted Out of Stock Amount is $34. The $34 is calculated by our new metric by dividing the normal product conversion rate (26/268 = 9.70149%) by the total Out of Stock Amount of $348 (348*.0970149=33.76), which means that the $34 amount is much more likely to be the lost value amount for that product. The cool part, is that since each product has different numbers of Orders and Product Views, the discount percent applied to each product is calculated relatively by our new weighted calculated metric! For example, while the Product View to Order conversion ratio for row 4 was 9.7%, the conversion rate for row 10 is only 2.6% (4/154), meaning that only $22 out of the $843 Out of Stock Amount is moved to the Weighted Out of Stock Amount calculated metric. Pretty cool huh? Before we go patting ourselves on the back, however, we have one more problem to solve. If you look at the report above, you might have noticed the problem in rows 1,2,3,5,6,8,9. Even though there is a lot of money in the Out of Stock Amount success event, there is no money being applied to the Weighted Out of Stock Amount calculated metric we created. This is due to the fact that there were no Orders for these products, meaning that the conversion rate is zero, which when multiplied by the Out of Stock Amount also results in zero (which hopefully you recall from elementary school). That is not ideal, because now the Weighted Out of Stock Amount is too low and the raw amount in the success event is too high! Unfortunately, our calculated metric above only works when there are Orders during the time range, so we can calculate the average Product View to Order ratio for each product. Unfortunately, there is no perfect way to solve this without manually downloading a lot of historical data to look for what the Product View to Order ratio was for each product over the past year or two, but the good news is that if you use a large enough timeframe, the cases of zero orders should be relative small. But just in case you do have cases where zero orders exist, I am going to show you an advanced trick that you can use to get the next best thing in your Weighted Out of Stock Amount calculated metric. As you can see, the rows that worked previously are unchanged (rows 4,7,10), but the other rows now have Weighted Out of Stock Amounts. 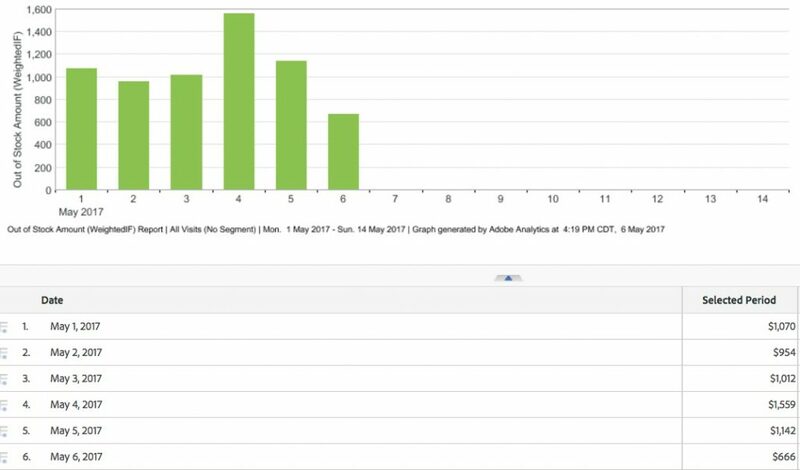 If you divide the total Orders by total Product Views, you can see that the average Order to Product View ratio is 4.21288% (16215/384,891). If you then apply this ratio to any of the Out of Stock Amounts with zero-Orders, you will get the Weighted Out of Stock Amount. For example, row 1 has a value of $286, which is 4.21288% multiplied by $6,786. In this case, you can remove the old calculated metric and just use the new one and as you use longer date ranges, you will have fewer zero order rows and your data will be more accurate. How much money are we spending on marketing campaigns to drive visitors to products that are out of stock? Which of our known customers (with a Customer ID in an eVar) wanted products that were out of stock and can we retarget them via e-mail or Adobe Target later when stock is replenished? If your site sells physical products and has instances where products are not in stock, the preceding is one way that you can conduct web analysis on how often this is happening, for which products and how much money you might be losing out on as a result. 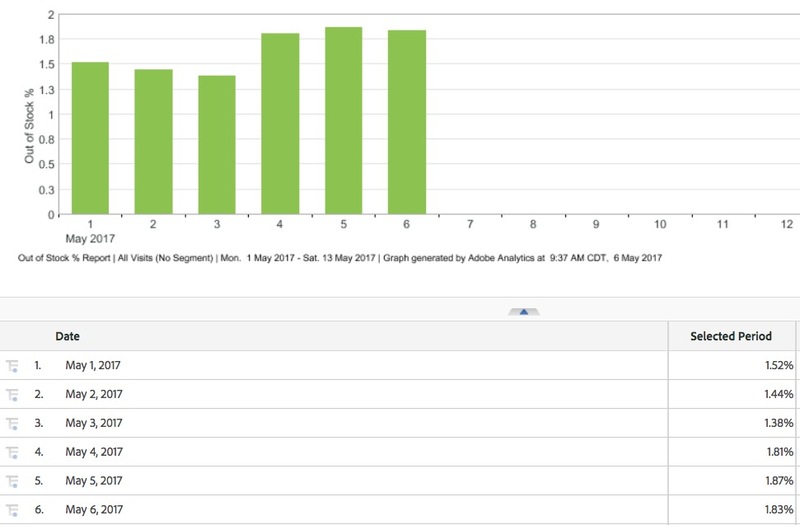 When this data is mixed with other data you might have in Adobe Analytics (i.e. campaign data, customer ID data, etc. ), it can lead to many more analyses that might help to improve site conversion. This is indeed useful when working with purchasing and demand planning departments. The product view to order rate (conversion rate) would be influenced by the products being out of stock, probably undercalling the real conversion rate. 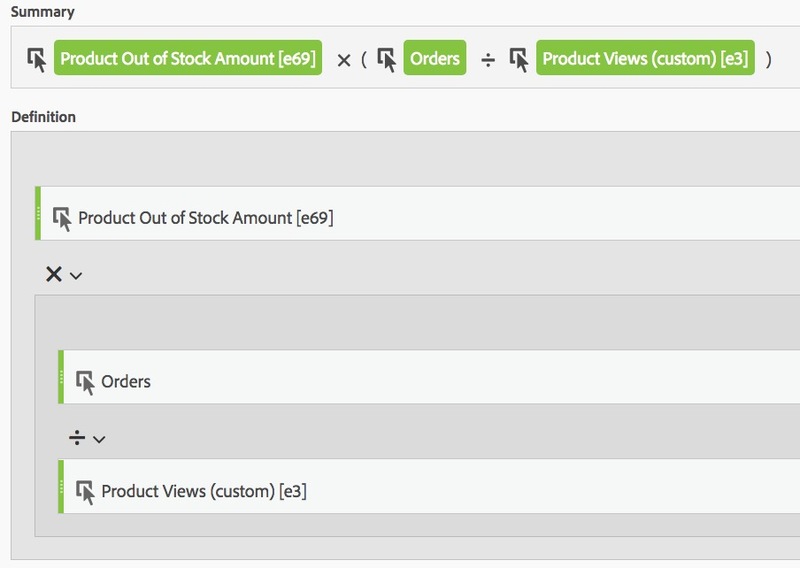 It could be controlled using segmentation to remove visits where an out of stock product would be seen. 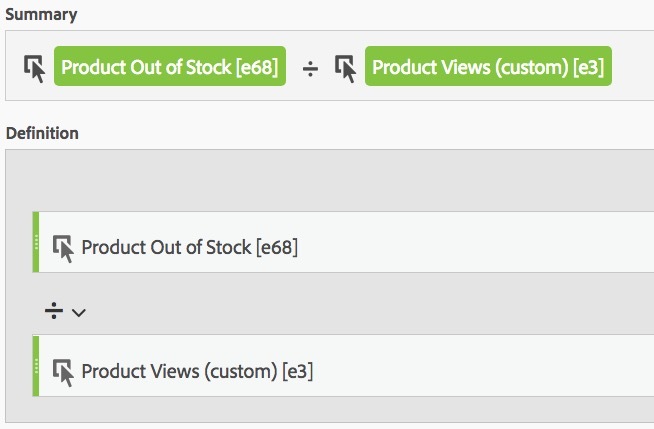 This could introduce other biases, but it would give a clearer view for products that have a high % out of stock views. You’d also be looking at a best case scenario for missed revenue opportunity as it doesn’t account for substitution into similar in stock products. Good points. There are lots of different variations and options with this concept, but the post was already a bit long!! Thanks! I’d like to add my experience on the subject. Since the stocking plan is based on aggregated purchase history of similar products, we can expect that being out of stock in S, M, and L is much more impactful than being out of stock on the “tails” of the distribution. That’s why nothing in the clearance section fits you unless you shop the “tails” anyway. Now let’s add another dimension on top of size. Typically color or fabric, again – not all SKUs are equal in the conversion equation. Every season has a “Hot” color (at least in clothing). If “mustard yellow” or “rose gold” is the hot color this season in whatever you’re selling, being out of stock in that color is very different than being out of stock in “misty blue” from SO last year. My suggestion is that in addition to the trusty old “prodView” event, we add a SKU merch evar, a SKU impression event, SKU inventory status merch evar, and a SKU out of stock event. All assuming that you can get this piped into the data layer for the PDP or Product QuickView with some freshness in relation to actual inventory. This adds a bit of complexity, but if you’re already tracking cart adds and conversions at a SKU level (with a merch eVar on the product string) you’re probably pretty close. The next step is the one between the traditional prodView and scAdd. This step is SKU selection. I like to set up a product string with productID, SKU merch eVar and a counter event called “SKU Selection”. Why mention this in the context of inventory? Imagine a PDP that has size and color selection but the UI is “smart” about it and it deactivates the out-of-stock sizes for the selected color (or deactivates the out-of -stock colors for a selected size). 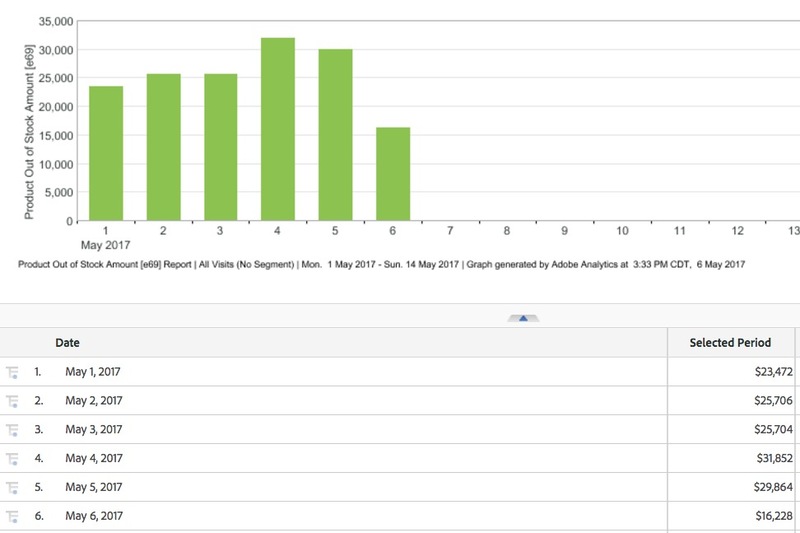 Do we track the clicks on those inactive size or color chips? Of course we do – unless we want to leave a very real signal of customer intent just sitting there! One more thing on the topic of SKU availability is the very real situation of a product going out of stock after being added to a cart. 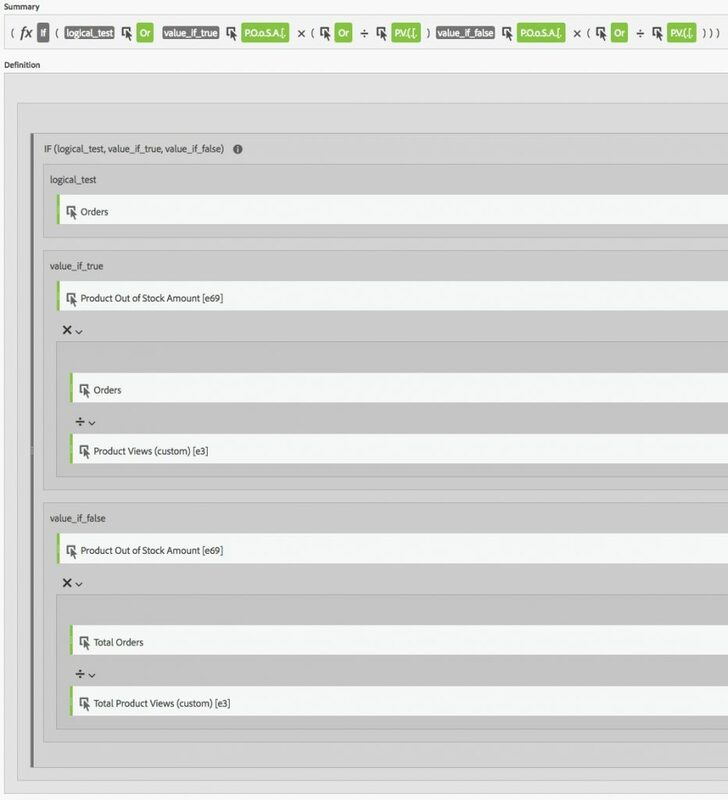 For this, I like the same structure as above but extended to the product string sent on the scView event. I hope my additional thoughts are a benefit to the community as well. Adam – I’m curious as to how you would apply this to sites that sell products that have variation (size, color, etc.) embedded into the Product Page. This means that the whole product isn’t OOS, but some of the variations might be. Typically, these variation options are in a drop-down menu or some other selector experience on the PDP. Nice write up. The other thing you can do with the 100% problem is constrain the report to a ‘useful’ segment. Some examples could be people who regularly engage with the site either by viewing or purchasing items.